Good gracious. 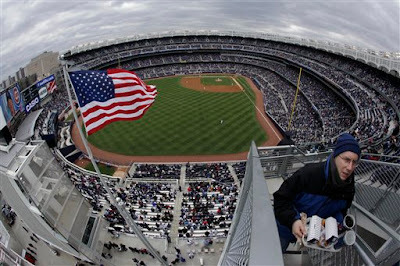 I didn't realize there were seats in the new Yankee Stadium that were higher than the effing flagpole. What's funny is that because of the camera lens (I guess), it looks like this photo is from higher than the top of the stadium. That fan looks like he's enjoying himself. Though to be fair, April in New York is one thing -- April in New York at high altitude is quite another.